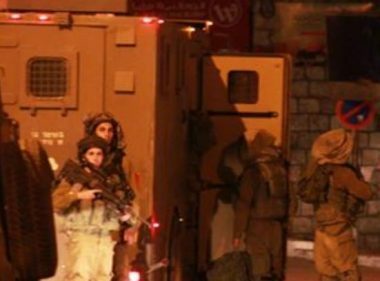 Israeli soldiers invaded, on Friday at dawn, several homes in different areas, in the occupied West Bank, and searched them before abducting five Palestinians. In Gaza, the soldiers carried out a limited invasion into farmlands, and opened fire at fishing boats. The Jenin office of the Palestinian Prisoners’ Society (PPS) in the occupied West Bank, said the soldiers invaded Ya’bad town, southwest of Jenin city, and abducted Ibrahim Sa’id Abu Bakr, Jareer Mohammad Zeid and Mohammad Sa’id ‘Amarna. The soldiers also searched homes in Husan town, west of Bethlehem, and abducted Mustafa Jamal Hamamra. In Hebron, in the southern part of the West Bank, the soldiers violently searched a home, causing excessive damage, and abducted a Palestinian after reportedly locating a “hunting rifle,” in his property. In addition, several armored military vehicles advanced dozens of meters into agricultural lands, east of Khuza’a town, in Khan Younis, in the southern part of the Gaza Strip, and bulldozed areas close to the border fence. Also in Gaza, Israeli navy ships fired many live rounds at Palestinian fishing boats, northwest of Beit Lahia, in the northern part of the coastal region, forcing the fishermen back to shore.